Gift cards are great, right? They spend like cash, but with that more personal edge. They say Hey, I know what you’re into, but I’ll let you pick the specifics. In a lot of ways, the gift card is the perfect gift. But at the end of the day, it’s just a flimsy piece of plastic. Not exactly something you can wrap up and place under the tree. The SwiftPack is the answer to how to add a little extra presence to your present. Something you can put a bow on. The SwiftPack is a beautiful hinged cigar-style box with a patented pop-up design that gives every gift-giving experience the thrill of opening a treasure chest. With nearly limitless customization options, your SwiftPack can be as unique as you are. Give it a ribbon or a bow. A textured pearl pattern or classy black gloss laminate. 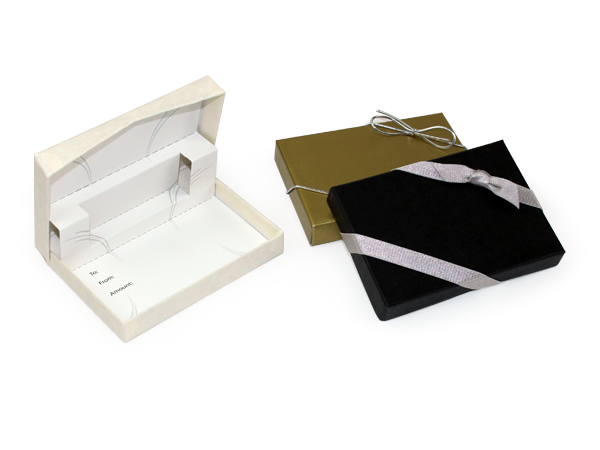 Personalize the insert with To, From, Amount, or anything else that needs saying on your occasion. The SwiftPack isn’t just for gift cards either. Pack it with a vacuum formed insert to house your Credit Card Flash Drive. Foil stamp your company name or logo to the outside.